While the Saleens and the Corvettes stayed in the pits early on in the session, the Vipers were fighting hard. Eric Debard (Tarrès Team Viper GTS-R) was initially quickest, but then Jean-Luc Blanchemain (Euroflash Autovitesse Viper) and Patrick Bornhauser (VBM Viper) improved on Debard's lap time. 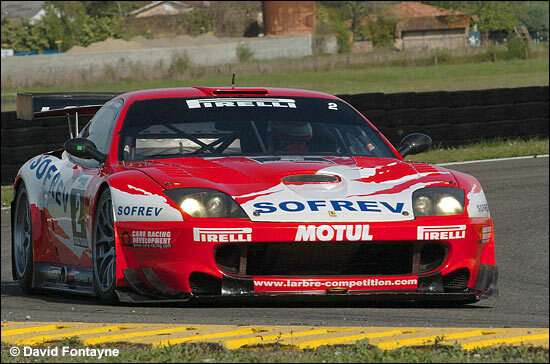 The defending champion improved still further, but David Hallyday (PSI Corvette C5-R) claimed the provisional pole. In the final moments, three men were really pushing hard. Within eight minutes of the end of the session, Bruno Hernandez (Oreca Saleen S7R) set the pole position, while Balthazard (Larbre Compétition Ferrari 550 Maranello) joined him on the front row, and Jean-Claude Police (CD Sport Viper) was fourth quickest. Thierry Stepec, at the wheel of the Creation Autosportif Lister Storm, had an off in the Roger Dubos curve. The session was brought to a close, leaving four different cars in the first four positions: Saleen (Hernandez), Ferrari (Balthazard), Corvette (Hallyday) and Viper (Police). In the GT2 Trophy, Claude Monteiro (Estoril Porsche 996 GT3 RSR) claimed the pole position, after a strong battle with Michel Lecourt's IMSA Porsche RSR. 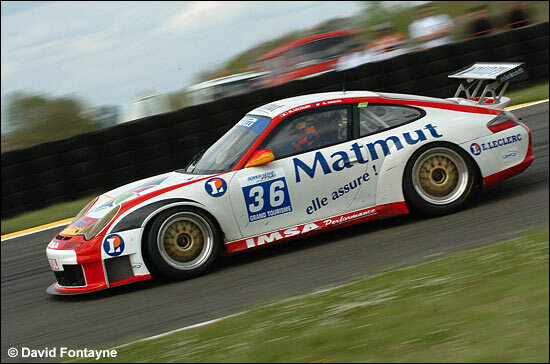 Eric Mouez (Protek Porsche 911 GT3 RS) was third quickest, ahead of Jean-Claude Ruffier ( Ruffier Racing Porsche 996 Cup). Hernandez was the best starter in the Saleen, but Balthazard took advantage of a slight mistake by the Oreca driver and was in first place at the end of lap one, ahead of Hernandez and Hallyday, who put a big pressure on him. Balthazard too made an error and was passed by both men. Behind them, Pertti Kuismanen, at the wheel of the PSI Corvette C6.R, enlivened the early stages and had been moving up from 10th to 4th place. Then, at the exit of the Alain Oreiller curve, Pierre Chamaraud was rolled and crashed his Porsche 996 Cup which was badly damaged. The leaders pitted together for the driver changes and positions were unchanged, Ayari (Oreca Saleen S7R - below), being ahead of Alliot (PSI Corvette C5-R) and Policand (Larbre Ferrari 550 Maranello). 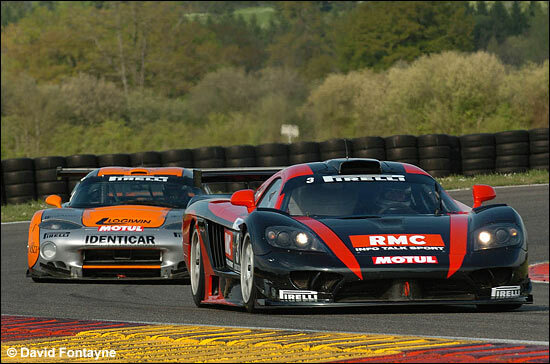 Palttala (PSI C6.R) and Dupuy (Protek Saleen S7R) were a bit further back. Ayari was pushing hard but Policand succeeded in passing Alliot for second. Dupuy fought past Palttala’s Corvette, then both men passed Alliot, in his (older) Corvette. 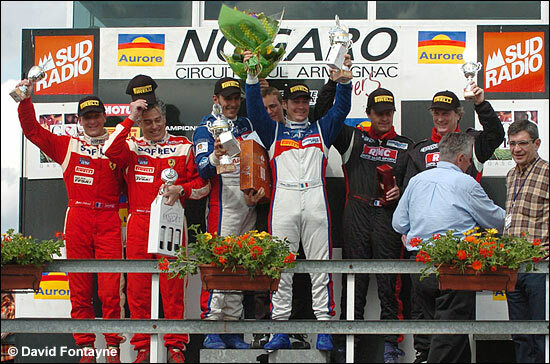 Ayari crossed the finish line as a first time winner in the Oreca Saleen, but Dupuy (above) didn't succeed in passing Policand (below) for second place. 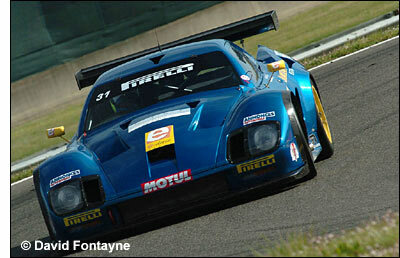 Palttala was fourth, Alliot, fifth, just a few tenths ahead of Bouchut's SRT Corvette C5-R. The defending champions, Thévenin and Bornhauser could not do better than finishing in seventh place, best of the Vipers – behind two S7Rs, a 550 and three Corvettes. In the GT2 Trophy, Claude Monteiro set the pace at first, but he had a puncture and so Narac / Lecourt (IMSA Porsche 996 RSR) ran out the winners. Cyril Prunet (Protek Porsche 911 GT3 RS) passed James Ruffier (Ruffier Racing Porsche 996 Cup) on the final lap for second place. 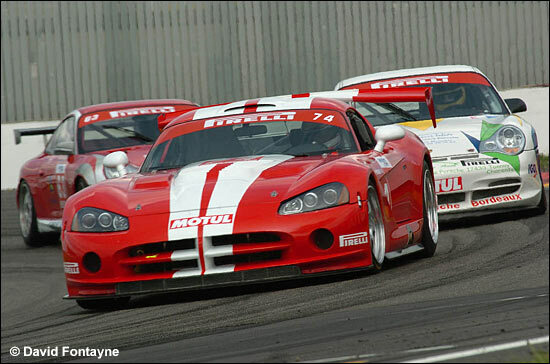 In the French Cup, the Dodge Viper GT3 had its first win, with Patrick Bourdais and Jean-Yves Adam at the wheel, ahead of two Porsche 996 Cup cars (Labescat / Philippon and Colas / Loger). 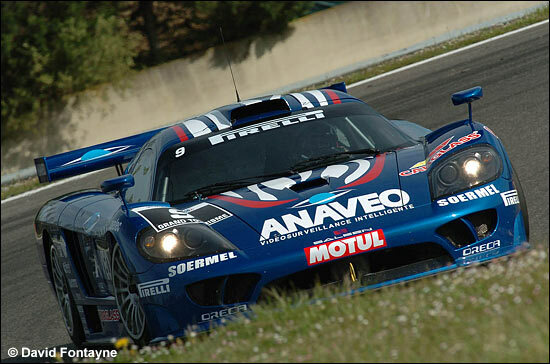 Soheil Ayari (Oreca Saleen S7R): Bruno (Hernandez) did the whole job. At the start of my stint, Alliot was coming back, but Bruno had saved the tyres, so I pushed hard to widen the gap. When my tyres were a bit used, I chose to manage the race. The car was very good. It is most important to have a good start of the season. Tomorrow, with 80 kgs ballast, everything's going to change. We have never tested the car with some more weight, so it will be another experience for the whole team. We are going to learn a lot of things during the whole season." Jérôme Policand (Sofrev ASP Larbre Compétition Ferrari 550 Maranello): "The track has changed a bit, when you left the right line, it was dirty. Our driver change was good, I could pass Alliot quickly, then I set a good pace which allowed me to save the car. In the late stages, Dominique Dupuy was coming back, but I knew that I was faster in the straights. I focused to come out properly of the Aviation Curve to have a good speed, so I could keep our second place."